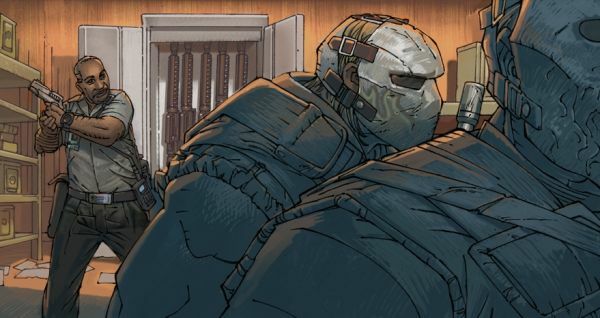 Army of Two: The 40th Day just got a narrative update in the form of comic book-style art by renowned artists Chris Bachalo and Jock. Cutscenes following moral decisions within the game will be adorned with these unique images in what EA Montreal hopes to be a significantly emotional storyline. This is an interesting concept to me, and should pay off. Style is necessary in this generation of gaming. See the press release below. Now, if you'll recall: the original Army of Two sought to combine co-op with versus multiplayer by promoting -- and nearly forcing -- teamwork in a small-map, small-team setting. [Creative director Alex Hutchinson] said to expect a "fully client/server" connection for Army of Two: The 40th Day multiplayer, with "many more modes and more people allowed to play." The original Army of Two featured a trio of multiplayer game types, supporting up to four players. Expect to be able to drop in and drop out of co-op focused multiplayer matches. And say goodbye to the region locked restriction on multiplayer games. The 40th Day dudes say you'll be able to play with your global buddies, making a co-op get together a little bit easier. Color me excited! I had nearly forgotten about the original game's versus modes, which was extremely promising and co-op friendly, but ultimately disappointing. Between this news and the customizable gun news from the other week, I'm adding this to my must-buy list. Montreal, Canada – July 23, 2009 – EA Montreal, a studio of Electronic Arts Inc. (NASDAQ: ERTS), today announced that renowned comic artists, Chris Bachalo and Jock have lent their artistic talents to ARMY OF TWO™: THE 40th DAY. The sequel to the 2008 multi-platinum co-op shooter, ARMY OF TWO: The 40th Day sees the return of the ultimate two-man private military team, Salem and Rios. As the action heroes fight for survival in a city under siege, the soldiers must make moral choices cooperatively that affect the pair as a team. Each moral decision sets players on a course that affects the gameplay and direction of the storyline. Bachalo and Jock have been enlisted to illustrate the long term impacts of these ‘morality moments’. On July 24 and 25 from 2pm - 4pm PST during Comic-con, Chris Bachalo will be signing original Army of Two: The 40th Day artwork at EA’s booth (# 5213). “Chris and Jock are amazingly talented artists. We’re excited that they have been able to contribute these evocative illustrations to depict the long-term consequences of the players’ key moral decisions,” says Reid Schneider, Executive Producer, EA Montreal. “These new morality choices are an innovative new feature that we believe will give a new layer to the cooperative experience in the game. Chris and Jock’s work give players’ decisions real weight and resonance,” added Alex Hutchinson, Creative Director EA Montreal. Chris Bachalo has worked on several critically acclaimed comic series including Sandman, Batman, Incredible Hulk, and Uncanny X-Men. He recently collaborated with Jeph Loeb, a producer for the hit TV show Heroes, to create the book Witching Hour and is currently working on Marvels’ flagship title, The Amazing Spiderman. An award winning comic artist from Britain, Jock is best known for his work with writer Andy Diggle on Vertigo's The Losers and the DCU's and Green Arrow: Year One. On top of creating production art for such films as Batman Begins, Hancock, and the upcoming adaptations of Dune and Judge Dredd, he's also illustrated stunning covers for DC Comics titles including Batman, Nightwing, Catwoman, Azrael and Scalped, as well as Marvel Comics Thunderbolts and Dark X-Men. Army of Two: The 40th Day puts players in the shoes of two private military contractors who suddenly find themselves trapped in the middle of Shanghai as it falls under attack. The two must work as a team to survive relentless enemy assaults and escape the city collapsing around them. The 40th Day is built from the ground up to deliver an organic and immersive cooperative experience. Featuring a robust playbook of co-op moves, players execute strategic two-man tactics and make game-changing decisions that result in a one-of-a-kind action experience. ARMY OF TWO: THE 40th DAY will be available this winter for the Xbox 360® videogame and entertainment system, the PLAYSTATION®3 computer entertainment system and the PSP® (PlayStation® Portable). 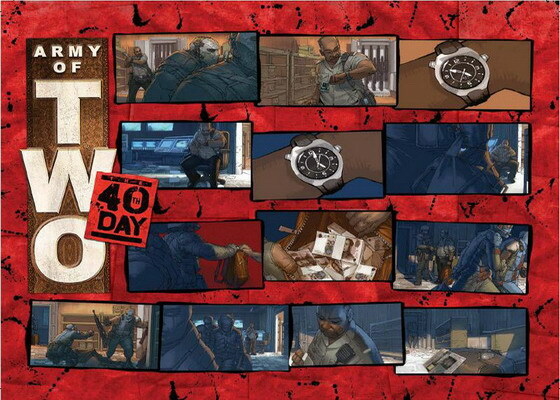 For more information on ARMY OF TWO: THE 40th DAY please visit: www.armyoftwo.com. For more information on EA Montreal, please visit www.eamontreal.com or www.ea.com. Or follow us on Twitter at http://twitter.com/Army_Of_Two. EA, EA SPORTS, EA Mobile, POGO and Army of Two are trademarks or registered trademarks of Electronic Arts Inc. in the U.S. and/or other countries. "PlayStation", “PLAYSTATION”, and "PSP" are registered trademarks of Sony Computer Entertainment Inc. Microsoft, Xbox, Xbox 360, Xbox LIVE, and the Xbox logos are trademarks of the Microsoft group of companies.